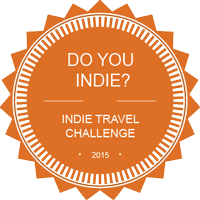 I will be challenging myself to write a blog post for every day in the month of November via the Indie Travel Challenge. Earlier this year, I did the Your Turn Challenge for 7 days, and had fun doing and committing to it. It is a worthwhile investment to spend your hard earned cash on long-term travel. For 20K USD or less, you can travel around the world for 12 months. Here is a piece on actual costs of long-term travel. Again, I’m not going to answer the question for #DoYouIndie today, but I will answer with a related thought on money and long-term travel with eight reasons that justify an ROI on your cash. 1) You won’t regret going. 4) With College/Universities costs going up so much, the value proposition of going to see and experience the world yourself makes more and more sense in comparison. 5) Grateful and Appreciative – Leaving home for a while, is often what it takes to appreciate what you had or don’t have in some cases. 6) Spending money on experiences, not things leads to happiness. Is a bigger house or a new Tesla going to bring you more satisfaction in life? 7) It will teach you. Here are some things it continues to teach me. 8) We live in a world that is more connected than ever. You can learn a lot from behind a computer/smart phone. It’s not the same as going, smelling, seeing, feeling your way through a new place. Long-Term travel is a superb way to build more emotional intelligence, which leads to higher wages. How will you manage your money when traveling? How will you pay bills and stay on budget? If you have done a RTW trip are there tips you can share? Think about how you manage money now, and how you prepare your monthly budget ahead of time. How would you adapt that to a possible trip?